What if you were shy? What if you were a cat? 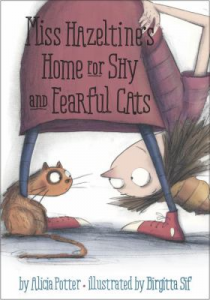 There would be a place where you belong: Miss Hazeltine’s Home for Shy and Fearful Cats. In this week’s picture book, Miss Hazeltine opens a special place for scaredy cats where she teaches them skills such as Bird Basics and Climbing Up and Down. One night, Miss Hazeltine goes missing, and only the shyest and most fearful cat knows where she was heading – is he brave enough to lead the way and bring her back home? Alicia Potter’s sweet story is brought to life by Birgitta Sif’s adorable illustrations. Check this story out for a quirky-yet-kind story about love, friendship, and bravery when it is least expected.